TOEFL is one of the prominent tests in English Language for the non native speakers. It helps them to get admission in Universities, for the criteria of the application of visas and scholarships. The test is conducted by ETS (educational testing service),a private organization which has in turn set up ‘Prometric Testing Services Pvt.Ltd as its testing agency in our country.The nine cities where TOEFL is conducted in India are Ahmadabad, Delhi, Allahabad, Bangalore, Calcutta, Chennai, Hyderabad, Mumbai and Trivandrum . Since preparing for this exam one is aiming to be at a global front and lead the co workers, one must keep in mind that this test is not just testing your caliber over English Vocabulary mentioned in books but it’s a test which keeps a check on your usage of English Language in scholastic environment. Hence, regular practice of sample papers is what one should instill in order to score better. A person has a firm ground in any language only when his basics and fundamentals of it are clear. Sometimes the over confidence of a student hampers his success .Therefore one should pay due attention to each concept that is being taught in the class. One way wherein you can exercise a maximum influence on your examiner is through your speaking section. Your speaking skills and your choice of words is what matters the most and holds utmost importance when it comes to give you a score.You should speak only those words in which you are comfortable,use of flamboyant words and phrases often puts you in trouble if you are cross questioned by your examiner. Accent, diction and intonation is something that students should take special care of. In order to come out as extraordinary don’t just change your accent unnecessarily or intonate where it is hardly required. Don’t just go according to the experiences of previous candidates as every student is different and hence your skill measurement and overall judgement would be entirely different from others. So keep a positive mind regarding the test and its marking and never forget these TOEFL preparation tips. Time Waits For None. This quote rightly specifies the importance of time management in a candidate’s life preparing for any exam. One must keep more time for sections in which he is lacking in but should also indulge in daily practice of sections he is good at in order to attain have a good command over it. Usage of punctuation marks is what shows how well versed a student is with the basic notions of English Language. While Preparing for TOEFL this is a major aspect that a student should excel in. 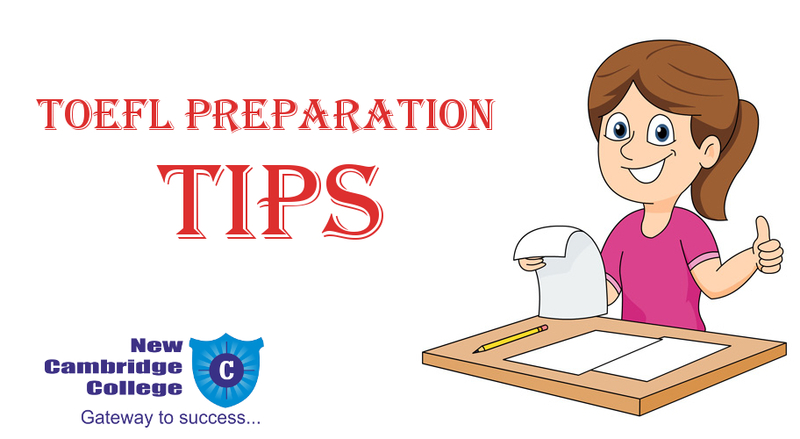 One must always keep in minds these TOEFL PREPARATION TIPS. Listening Section has time boundation of 60-90 minutes comprising of 34-51 questions. Speaking section involves completion of 6 tasks in the stipulated time of 20 minutes. Lastly Writing section has just 2 tasks wherein they judge a candidate’s opinion over some topic with 2 tasks in 50 minutes.